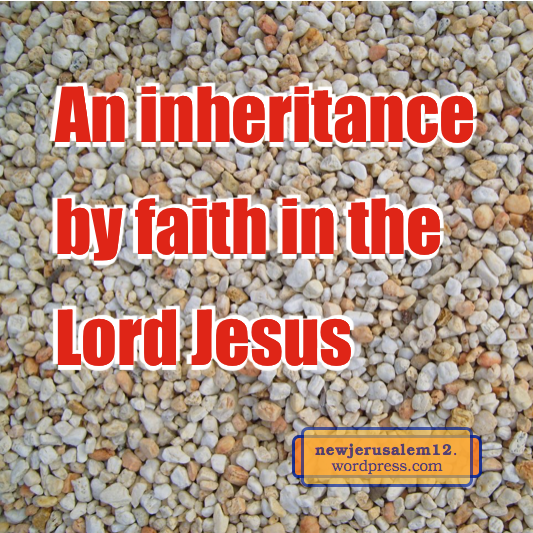 Through the death of Christ we receive the promise of the eternal inheritance (Heb. 9:15). Hebrews 9:15: Jesus Christ “is the Mediator of a new covenant, so that, death having taken place for redemption of the transgressions under the first covenant, those who have been called might receive the promise of the eternal inheritance.” This eternal inheritance will be New Jerusalem with all that the Triune God is for us and to us. 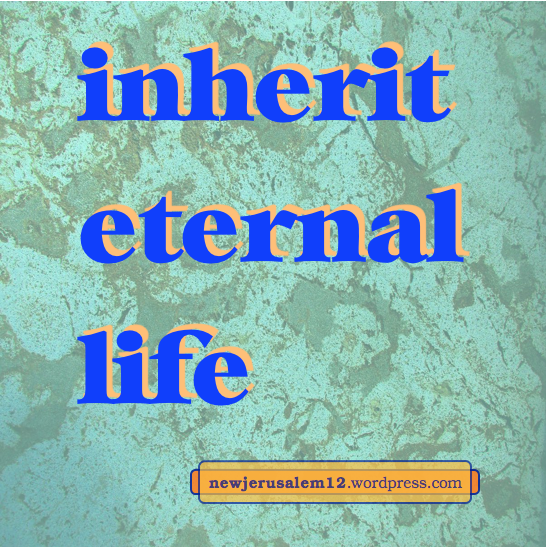 In the New Testament “inherit,” when used in a positive sense, is usually associated with eternal life and the kingdom. Both are characteristics of New Jerusalem. It is a city of life and it is the center of God’s eternal kingdom. In this kingdom we “will reign forever and ever” (Rev. 22:5). We are born into this kingdom by receiving the eternal life. Today we have this life and we are partakers of the inward reality of the kingdom, as John was even when in exile on Patmos (Rev. 1:9). As this life increases in us we “reign in life through the One, Jesus Christ” (Rom. 5:17). Ultimately this life and kingdom are realized as New Jerusalem. 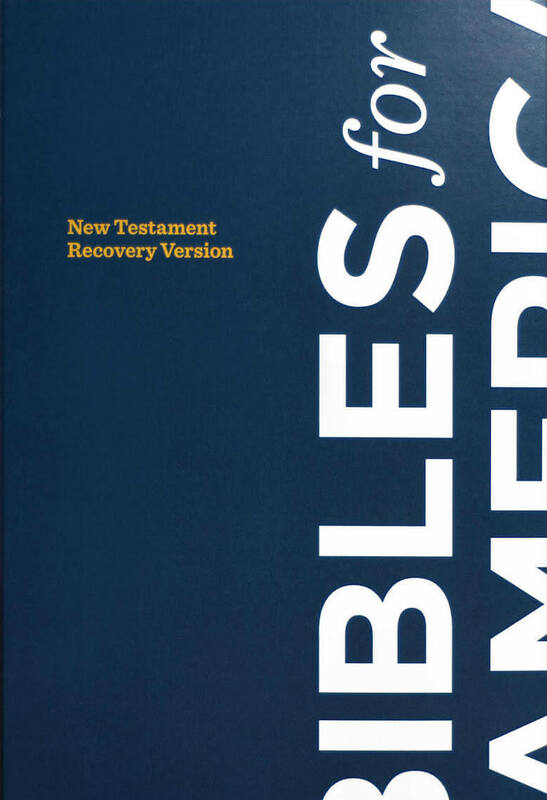 Besides eternal life and the kingdom, the New Testament speaks of our inheriting salvation, God’s promises, and blessing. All of these are what God in Christ has done for us, is doing in us, is to us and will be to us. No blessing can compare with God Himself. 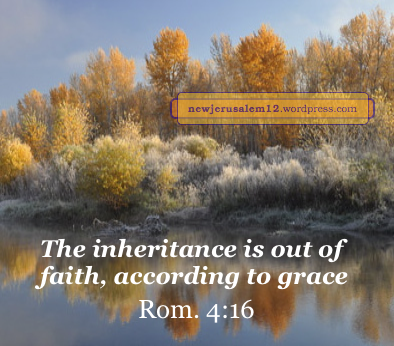 We should not expect physical blessings in New Jerusalem. 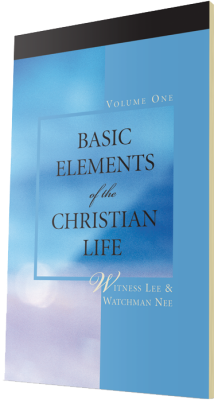 Rather, Christ being life to us in the fullest degree, unlimited in any way, will be our eternal blessing and inheritance. 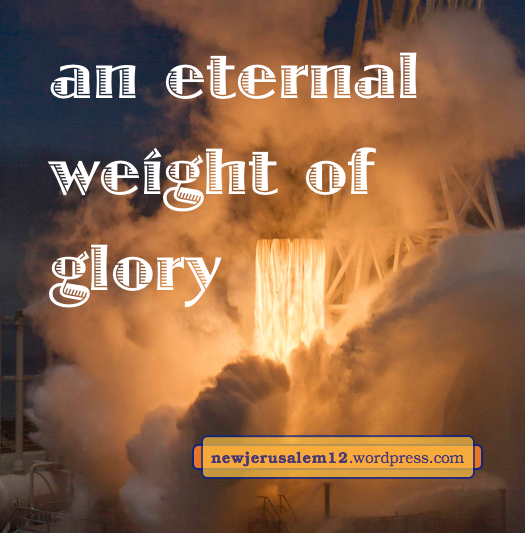 We had recent posts on Eternal Life and New Jerusalem. 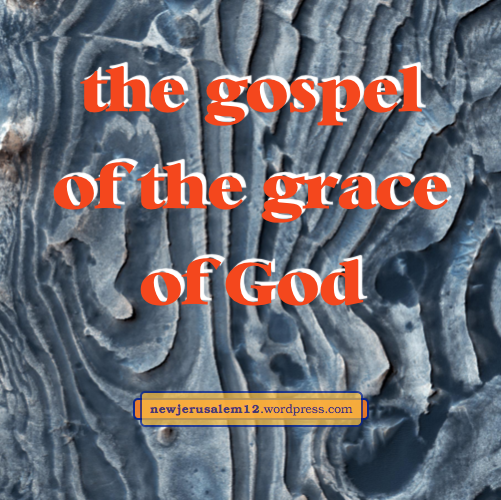 Now we look at other eternal matters in the New Testament and how they relate to New Jerusalem. First, God is eternal. And God is on the throne in New Jerusalem. He is the eternal center and the eternal nature of the city. The eternal God is incorruptible (1 Tim. 1:17), making New Jerusalem incorruptible. The Lord Jesus died on the cross and “through His own blood, centered once for all into the Holy of Holies, obtaining an eternal redemption” (Heb. 9:12). This eternal redemption is for now and for New Jerusalem, where it is eternally displayed by the Lamb on the throne (Rev. 22:1). After His death, God raised our Lord Jesus “in the blood of an eternal covenant” (Heb. 13:20). This eternal covenant/agreement/contract includes New Jerusalem, the eternal city. Based on His eternal redemption and covenant, the Lord is now “the source of eternal salvation” (Heb. 5:9). 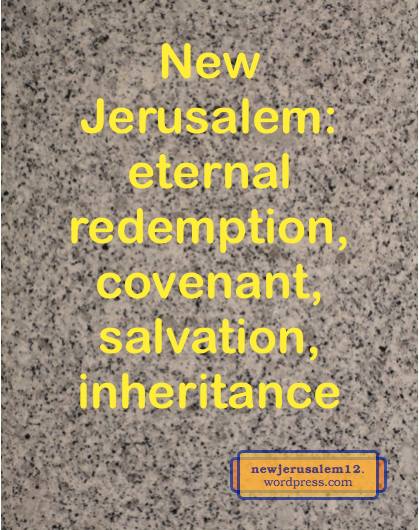 The salvation we received includes our eternal participation in New Jerusalem. Also, through His death and resurrection, the way is open that we “might receive the promise of the eternal inheritance” (Heb. 9:15). This is not an earthly nor a physical inheritance but “incorruptible and undefiled and unfading, kept in the heavens for you” (1 Peter 1:4). Ultimately this heavenly, eternal inheritance, New Jerusalem, will “come down out of heaven” (Rev. 21:10). Jesus Christ is our eternal life. “The gift of God is eternal life in Christ Jesus our Lord” (Rom. 6:23). 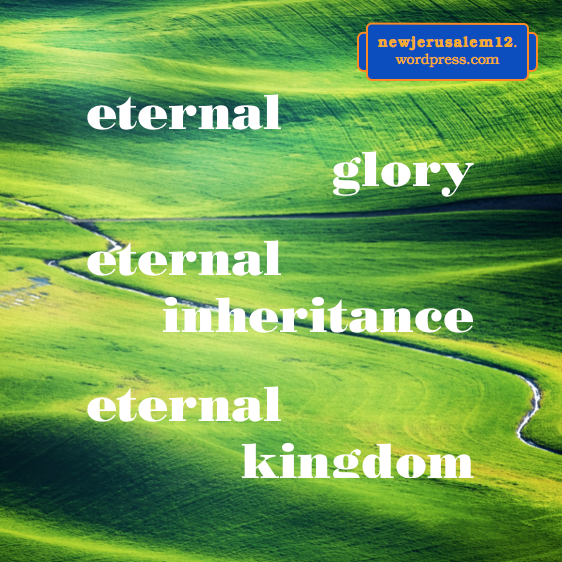 New Jerusalem is an eternal city, so it is intimately tied with this eternal life. We receive this life, which is Christ Himself, by believing. Our believing is our response to God’s appointing (Acts 13:48). To be appointed to eternal life also means to be appointed to New Jerusalem. 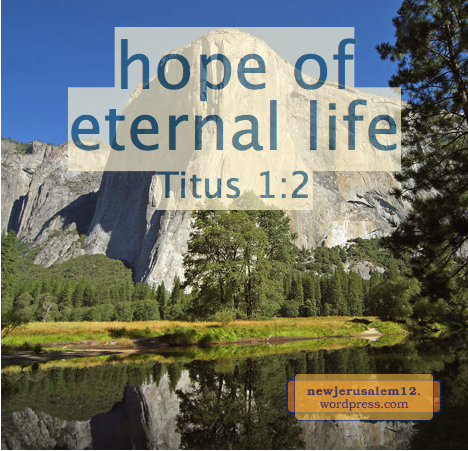 Titus 1:2 and 3:7 speak of “the hope of eternal life.” On one hand, the eternal life we have already received gives us hope for the future, including hope for New Jerusalem. On the other hand, we have hope for our future that we will have a greater portion of and greater participation in eternal life. 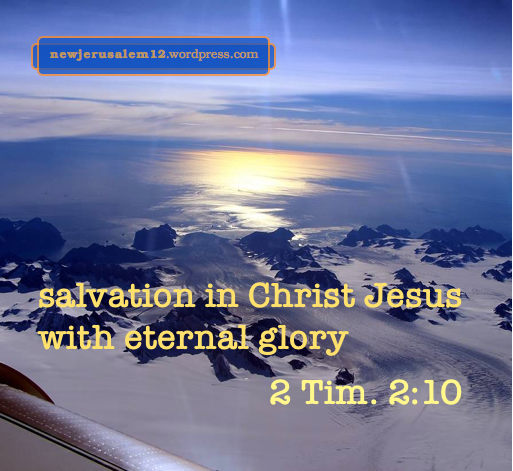 At the time of our salvation we received eternal life. When the Lord returns we will “inherit eternal life” (Matt. 19:29, Mark 10:30)—not a different life but an enriched portion of the same life we initially received, and New Jerusalem will be the richest portion of eternal life. Our future inheritance of greater eternal life depends on our hating/denying/losing our soul life, our self. The Lord tells us to deny the soul live so that we may live Him as our eternal life. Eventually we will all make this transition from the fallen natural life to the divine, eternal life, the life of New Jerusalem. In Acts 26 Paul recounts his calling by the Lord in Acts 9. 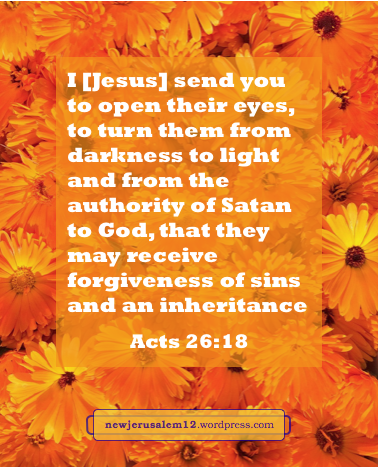 The Lor d told Paul He was sending him to the nations (v. 17), “To open their eyes, to turn them from darkness to light and from the authority of Satan to God, that they may receive forgiveness of sins and an inheritance among those who have been sanctified by faith in Me” (v. 18). Every point of this commission has a fulfillment in New Jerusalem. The first point is “to open their eyes.” In New Jerusalem we will see the face of God and the Lamb (Rev. 22:4). The second point is “to turn them from darkness to light.” In New Jerusalem there will be no darkness. “Night will be no more; and they have no need of the light of a lamp and of the light of the sun, for the Lord God will shine upon them” (Rev. 22:5). Not only no darkness; even more there is no natural light from the sun nor man-made light from a lamp. The light of the city is Christ, the light of life (John 8:12). The third point is a turn “from the authority of Satan to God.” In Revelation 20 Satan, the devil, is cast into the lake of fire forever (v. 10). And in New Jerusalem there is “the throne of God and of the Lamb” (Rev. 22:1, 3). The fourth point is “sanctified by faith.” By faith we become immediately holy in position and gradually holy in our nature to match “the holy city, New Jerusalem” (Rev. 21:2). The fifth point, the first result, is “forgiveness of sins.” All sin and sins will have been put away by the time New Jerusalem comes down out of heaven. As a testimony, God and the redeeming Lamb are the temple (which is the whole of New Jerusalem), the Lamb is the lamp, and they are on the throne (Rev. 21:22, 23, 22:1). Ephesians 1:3 tells us that God the Father “has blessed us with every spiritual blessing in the heavenlies in Christ.” Verses 4 to 14 describe these blessings. 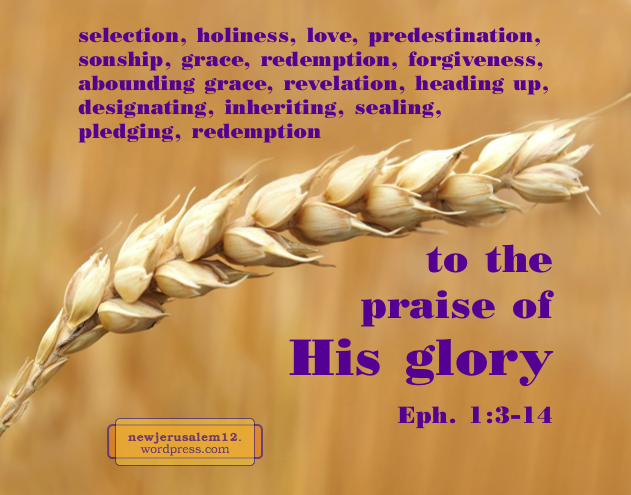 Because they all result in the praise of God’s glory, and because God’s glory is manifested in New Jerusalem, these blessings point toward and prepare the way for New Jerusalem. Ephesians 1:14 says that the Holy Spirit “is the pledge of our inheritance unto the redemption of the acquired possession.” The pledge is the guarantee, keeping us for God “unto the redemption.” The redemption here is not the forgiveness of sins in verse 7 but is the redemption of our mortal body, as in Romans 8:23. Philippians 3:21 says that our Lord Jesus Christ “will transfigure the body of our humiliation to be conformed to the body of His glory.” Here also the blessings in Ephesians 1 (in this case the redemption of the acquired possession) conclude with glory, thus corresponding with New Jerusalem. 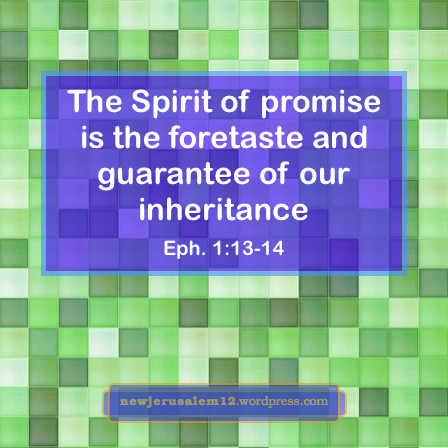 Prior posts focused on Ephesians 1:3-4, 1:5-6, 1:7-9a, 1:9b-10, 1:11-12, and 1:13-14a.